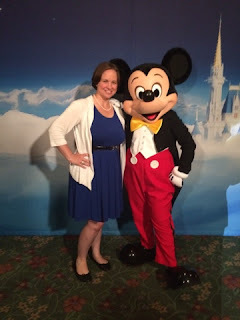 Running on Pixie Dust: Disney Bounding - Show your #DisneySide! Disney Bounding - Show your #DisneySide! Disney Bounding is a term that even some of the more experienced Disney travelers don't know. This is all about fashion and brining a little #DisneySide to your day without looking like you're a cartoon character. The idea behind Disney Bounding is to dress in outfits that are "inspired" by a Disney character. One quick search on Pinterest will give you lots of great ideas. I've started to compile some of my favorites on a Pinterest board to keep an eye out for pieces as I shop. 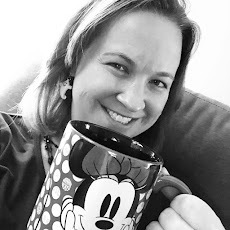 I made my first attempt at Disney Bounding this past Monday for the Disney Social Media Moms Celebration On the Road in New York City. Here I am with Mickey. . .can you tell which character I'm going for?? If you guessed Belle, you'd be correct! She is one of my favorite Disney princesses and the one I probably relate to the most. This look is the classic small town Belle. I have her signature blue dress and paired it a white cardigan. I also wore black flats (which of course you can't see) to complete a simple Disney Bounding attempt. The beauty of Disney Bounding is that it's like a little secret among Disney fans. You wouldn't know that I'm Disney Bounding by the outfit above, unless you knew to look for it. Periodically working Disney Bounding into your wardrobe is both a fun and fashionable way to share your #DisneySide! Try it out and enjoy! !